Last weekend I was fortunate to have a visit in a village of West Bengal, few hours away from my home. As from some of my previous posts, you might have an inkling that I cherish the village life more than the cities, where they claim all the luxuries pervade. Reasons are quite simple: Fresh air, water, pristine environment, lush green fields and more importantly very simple people (in general:)). Apart from many memorable experiences gathered in this short trip, the one which I would like to share is my time spent in a Byre or Goshala. Many of you must be aware that a Goshala is place where many cows are kept and served. In return, we get milk and other byproducts. So when I stayed for some time there, I found myself closer to the nature. There were more than 100 Cows and each has got unique name such as Surabhi, Mala, Vasundhara etc. It was very confusing. Yet, the one who takes care of those cows knew each one of them by their name. And I saw when he called their name, they responded too 🙂 It was very thrilling to me. Cows are companion of humans since ancient time and one species which have served humans more than any other animal. Especially in India, it’s not treated as animal but as mother, and rightly so. The cows are very simple, innocent, gentle, affectionate, emotional and intelligent. When you will see a calf close to her mother, the affection between them will give you peace in the heart, just by seeing how the speechless species responds to each other. In our ancient scripture, which we don’t have the time to read, is full of the glories of the cows. Yet, when I come to city and hear that slaughtering of the cows are at full swing all over the world and even in India, just to earn money, it disturbs me. It disturbed Mahatma Gandhi too. I am quoting Gandhi ji from the tabloid Young India, which he used to edit himself. Gandhi ji was an avid promoter of cow protection. Even though it got endorsement of Gandhi Ji, there is a common sense so as not to kill cows, just for the sake of eating it and making money . No one would like to kill his/her mother: This is an emotional appeal. Mother gives us milk for only two to three years after child is born. We are served, nourished by the milk of cow for much longer duration. Isn’t she is even better than mom in this aspect? Economic significance: Even if you will say that, no I am not an emotional Man/Woman I purely believe in the economics, still there are reasons that one should not thrive for killing cows. Cow’s dairy product is an important ingredients in our food chain. From milk to cheese, from Ghee to Lassi and many more dairy products are just due to cow, which are rich in nutrients. Cow helps in agricultural activity. And especially in India, where people are still deprived of many advances machinery and the size of fields are very small. Even the waste of cow, such as cow dungs and cow urine is used. Cow dungs are used to produce organic manure. Unlike modern artificial manure, which helps to grow productivity initially and after frequent use it makes the land barren, the organic cow manure is having no ill-impact on the soil. Cow’s urine is used for medical purposes in Ayurveda, which is gaining acceptance all over the world. Religious aspect: Yes, since India is a home of world’s ancient religion and they are in a huge number, their religious sentiments matters too. In Hinduism, Lord Krishna is also known as Gopal, means protector of the cow. In many scripture, killing a cow is considered very sinful and ominous. Hence it’s the responsibility of the state to make such arrangement that cows can be preserved and not slaughtered. Even though there are so many substitutes to gratify one’s tongue, I don’t find any reason why the people kills such an innocent species. During my visit, I was inquiring about various aspects and functioning of Goshala, then one of them responded to the question of cow slaughtering in a very interesting way. He said Lion or for that matter, any carnivorous animals prey not to gratify their taste, but to satisfy their hunger as, Lord has made them in such a way that they can’t be Vegans. But why humans kill animal is beyond comprehension. Author AbhayPosted on March 1, 2017 March 1, 2017 Categories Travel, UncategorizedTags Cow, Cow Protection, culture, Earth, Environment, Gau Mata, Humanism, Life, Love, Mother, Nature, Relogion, Spiritual, Travel, Vegan, Vegeterian21 Comments on Holy Cow!!! 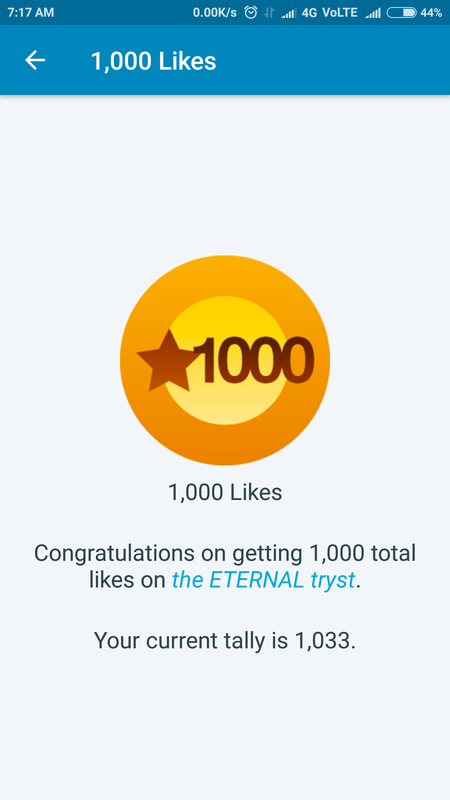 Word Press has just notified me that my posts have attracted 1000 likes. Journey in this platform , till now, is very short, yet exciting. हिन्दी के सभी पाठक मित्रों का विशेष आभार, स्नेह बनाये रखें! miserably. After giving a thought, I am forced to conclude that, at least one side is telling a blatant lie or there must be more than one version of Truth. Author AbhayPosted on February 25, 2017 February 25, 2017 Categories ContemplationTags Relationship Truth Honesty Love Life17 Comments on Truth? यह कौन सा मौसम है? Jubilee Park, Jamshedpur. Credit: Google Image. शाम को पार्क में बैठा था. हवा में ठंडक थी, मानो पेड़ एयर कंडीशन में बदल गये हों. उसके हरेक झोके मन को सुकून पहुँचाने वाले थे. तभी, अचानक एक लड़के ने “चिप्स, आलू का चिप्स ” की आवाज़ लगायी. मेरी ओर बढ़ा और पूछा क्या आप लोगे ? मैंने उसे देखा. 14-15 साल का होगा. चेहरा मासूम सा. मैंने पूछा कितने के दिए? उसने कहा 10 की एक पैकेट. फिर, मैंने उससे नाम पूछा और पूछा कि कहाँ रहते हो. उसने नाम बताया “मुन्ना” और जहाँ रहता था उस बस्ती का नाम बताया. फिर मैंने पूछा कि स्कूल नहीं जाते? उसने बोला “हाँ जाता हूँ न, मैथ्स में कुछ पूछिये”. उसका आत्मविश्वास देख में हतप्रभ था. शायद ही मैं किसी को इतने विश्वास से कुछ पूछने को कह पाता. मैंने कहा एक पैकेट दे दो. उसने चिप्स के बोरे में से एक पैकेट मेरी तरफ बढ़ा दी और पूछा कि पानी की बोतल भी लेंगे? मैंने कहा नहीं, इसकी जरुरत नहीं है. मेरी जिज्ञासा उसमे बढ़ी और पूछा कि पापा क्या करते हैं. उसने कहा “गोलगप्पे बेचते हैं, आप सोच रहे होंगे कि मुझे चिप्स क्यों बेचना पड़ता है”. मैं चुप रहा, वो खुद बोलने लगा “मेरी दसवीं की परीक्षा है और आगे मुझे और पढ़ना हैं. इंजीनियरिंग करना हैं. उसके लिए कोचिंग लगेगी. तो मैं शाम के खाली समय में कभी कभी आकर बेचता हूँ. ज़्यादा नहीं पर थोड़े सही पैसे तो बच जायेंगे, जो बाद में काम आएगी नहीं तो सारा बोझ पिताजी पर आ जायेगा”. तभी अचानक सिटी की आवाज़ सुनाई दी, दो सिक्योरिटी गार्ड मेरी तरफ दौड़ा, मुझे समझ नहीं आया कि हुआ क्या? तब वो लड़का भागा. मैं हैरान. कुछ दूर तक गार्ड ने दौड़ाया, पर उसकी दौड़ काफी तेज थी, गार्ड मोटे थे, थक कर रुक गए. फिर वापस आने लगे. मेरे मन में शंका हुई कि लड़का कहीँ चोर-वोर तो नहीं. गार्ड सामने से गुजर रहे थे, मैंने पूछा गार्ड साहब, उसको दौड़ाया क्यों? गार्ड साहब बोले “बदमाश हैं साले, बार बार मना करो फिर भी नहीं सुनते, पार्क में चिप्स या और कोई चीज बेचना मना हैं. प्लास्टिक का पूरा कचड़ा फ़ैल जाता हैं”. चोरी वाली बात सोच मन मे लज्जा आयी. गार्ड भी अपनी ड्यूटी पर थे, पर लड़का अपनी ड्यूटी से ज़्यादा कर रहा था. रिस्क लेकर भी. तभी अचानक याद आया की इस अफरातफरी में मैंने तो उसको पैसे दिए ही नहीं और वह जाने कहाँ चला गया. सोचकर अच्छा नहीं लग रहा था. चिप्स का पैकेट लिए मैं घर की तरफ निकला. पार्किंग में लगी अपनी गाड़ी में जैसे ही चाबी लगायी की वो लड़का वापस आया और बोला “भैया पैसे”? सच कहूँ तो आज तक किसी को पैसे देने में इतना मज़ा नहीं आया था. जेब से 100 का नोट निकाला और बढ़ा दिया उसकी ओर उसने 90 रुपये वापस किये और मुस्कुराते हुए दूर जाने लगा …वह जिधर जा रहा था वहां अंधकार था, शायद सरकार के स्ट्रीट लाइट की रौशनी वहां तक नहीं पहुंचती होगी. रात ढली और घर पहुंचा. खाना खाने के पश्चात, जब सोने की बारी आयी तो गर्मी का अनुभव हुआ, पंखा को 5 पर करके सोना पड़ा. रात ज्यों ज्यों ढली तो ठण्ड भी बढ़ने लगी, २ बजे के आस पास चादर शरीर पर जगह बना चुकी थी. 5 बजे नींद खुली तो देखा, पतली कम्बल ने भी मुझ पर अपना कब्ज़ा जमा लिया था. उठा तो ठण्ड थी. नहाने के लिए पानी को थोड़ा गुनगुना करना पड़ा. घर से निकला तो बाहर पार्क में घास पर ओस की बूंद पड़ी थी, मानो बारिश हुई हो रात में. 9 बजे थे, धुप तो निकल चुकी थी पर हवा के चलने से तपिश का एहसास न था. पर दो पहर के खाने के बाद, जब बाहर खुले में निकला, तो ग्लोबल वार्मिंग का प्रत्यक्ष आभास हुआ. सोचा की फूल शर्ट पहनना ही ठीक था. पीने का पानी तो ठंडी ही जच रही थी. पेड़ के अधिकांश पत्ते पीले पड़कर, उसका साथ छोड़ रहे थे. पर कुछ नए पत्ते शाखों पर दिख रहे थे, मानो पेड़ की उम्मीद अभी बची हो…..
मुन्ना के जीवन में कभी कोई ऐसा समय आया होगा कि वह सोचे कि अभी कौन सा मौसम है? Author AbhayPosted on February 23, 2017 February 24, 2017 Categories Fiction, Hindi Short Story, StoryTags Autumn, Confidence, Contemplation, Fiction, Hindi, Hindi Story, Poverty, Season19 Comments on यह कौन सा मौसम है? जो भी भारतीय हैं, उनके मन में अपने सैनिकों के लिए अपार सम्मान होता है. युद्ध हो, आपदा आये, सैनिक ही रक्षक बनकर आते हैं. हाल ही के समय में सेनाओं पर हमले की खबर काफी ज़्यादा सुनने को मिल रही है. मन आहात था. कुछ पंक्तिया लिखीं, आप सब तक बढ़ाता हूँ. आप अपनी प्रतिक्रिया मुझ तक पहुंचाइए..